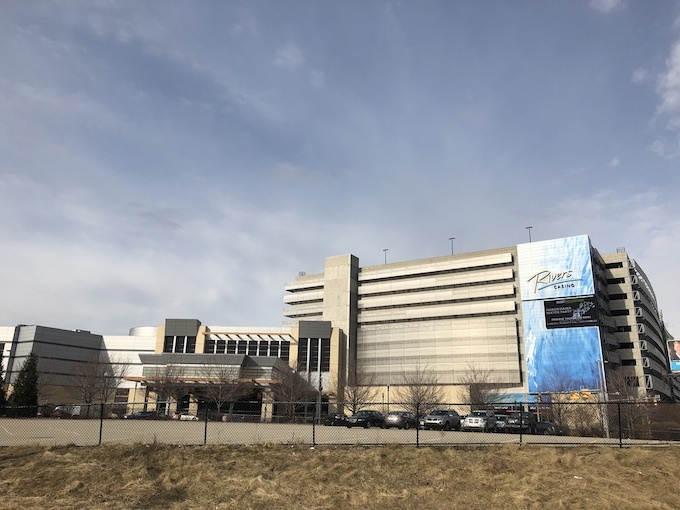 On Tuesday night, March 12, 2019, I visited Rivers Casino Pittsburgh in the great state of Pennsylvania. My purpose in visiting wasn’t to have a wonderful evening playing slots, although it turns out I did. I was there to evaluate the casino for you. I played a few high limit slot machines, talked with a few people, tried out a few of my winning slots strategies on lower limit slot machines, had dinner at their buffet and even played a penny slot machine for a while. Here is my trip report for Rivers Casino Pittsburgh. Whenever you walk into a casino for the first time, find the players club counter and get a players’ club card. If you’re already a member because another casino uses the same rewards program, then you won’t have to. Unless, of course, you don’t have your card. I wasn’t a member of the Rush Rewards Players Club at Rivers Casino Pittsburgh, so I found the club counter. As typical for me, I had questions. Also usual for me at club counters, I didn’t get entirely satisfactory answers. I’ve mentioned this before, this lack of valuable information from the personnel at club counters, back in my article Seven Advantages of Players Clubs for Playing Slots. Casino employees can’t gamble at the casinos they work for, so they don’t know the rules from personal experience. All they know is what they’ve read or learned. Therefore, there’s no reason to get upset about their lack of knowledge. That’s why I asked for a brochure. A little surprisingly, they didn’t have any on hand. As I visit more and more casinos for you, I’ll have to check and see if this is the latest trend. Perhaps it’s all online these days. I’ve since checked the casino website where I found a link to Rush Rewards under the Casino tab for Rivers. All the rules are there, as far as they go. The perks for each tier level are somewhat generic. Also, as usual, I’ve found an essential piece of information is missing. How much do I need to spend to earn one Base Point? That information is not anywhere on the page. Why not? My best understanding is this: How many points earned is very much a mystery for table game players. For slots players, it’s simple. In slots play, money spent equals points earned. Not so for table game players. For them, their rate (as they call it) is based on how much they bet as well as how long they sit at a table and play. Sometimes it even depends on how much they tip their dealers. For slots players, as I mentioned, it’s simple. Having been to Rivers Casino myself, I can tell you that one U.S. dollar spent equals one Base Point earned. That’s pretty good. The second thing I chose to do at the casino was to find the High Limit Slots Room. In part, this is because, when I’m gambling for myself and not you, I’m entirely a high limit slots player. But, I was visiting and evaluating this casino for you. Still, I attended the high limit slot machine area because I learn something about the quality of a casino from all the time I’ve spent in high limit slot rooms elsewhere. And, I have to say, I liked the look of theirs. It was clean and walled off. It had around a hundred slot machines and had a counter staffed with two slot attendants and a floor manager. Those are all good signs. I felt encouraged by all this goodness, so didn’t immediately leave the high limits room. I’d only planned to spend $200 during this visit to Rivers Casino, but probably only needed half of it to perform the casino evaluation. So, I spent $100 in this high limit slots room. I spread it around, though. I couldn’t resist playing a Wheel of Fortune slot machine which was also a Five Times Play machine. One machine with both of my favorite games! I made 5 bets, spending $25 in total without winning anything. Oh, well. I next tried three high limit slot machines showing a winning reel combination, spending $25 on each. What I was doing was testing my winning slots strategy 6 described in 3 Easy High Limit Slots Tricks (Winning Strategy 6). Long story short, it didn’t work. Not for me, on that trip, with less than $100 to spend in that high limit slots room. So, let’s take a breath for a moment and think about all that we’ve learned so far. The casino invests in their high limit slots room, implying players win taxable jackpots. The 5-pull slots strategy isn’t set up to win at this casino. Being a limited attempt due to a very small bankroll, this is not a conclusion. Not yet. For now, it’s just under consideration. There is just no way to test several of my other winning slots strategies, given this was a one-night-only evening visit nowhere near a holiday. After leaving the high limit slots room, I entered part of the casino which has quarter slot machines. If you’ve ever been to Rivers Casino, the area I’m talking about is just outside of the walled area of the High Limit Slots Room. It was there I decided to test Winning Strategy 1: Only Win Immediately which I often call the 5-pull method. Again, this was a Tuesday evening in a casino around 7 p.m. Few people were around, although it wasn’t empty. This low attendance indicates it is a great time to test the 5-pull method. You’re looking for a time when the slot machines will have sat idle for a little while. On a busy Friday night, for instance, that doesn’t happen. So, I walked up to a bank of slot machines. It doesn’t matter what games there were. They weren’t video slots or progressive slot machines. Well, a few progressive slots were nearby, but trying my Slots Strategy 2: Progressive Slot Machines wasn’t on my to-do list this trip. Maybe next time. One thing I did notice was that the maximum number of credits to bet was one credit higher for slot machines on either end of each row of slot machines. If the middle 4 or 5 slot machines were 2-credit machines, then the end slot machines were 3-credit machines. I hadn’t noticed that before. Have you? I also noticed some things which were missing. None of these machines had any bonus rounds, meaning I’d have the same odds of winning when betting any number of credits. I made the maximum credit bets each time. So, I had my remaining $100 bankroll for low limit slot machines. I put it all into the first slot machine. I avoided the slot machines on the ends with the higher maximum credits. I also avoided all slot machines with chairs that slot attendants had not pushed back into place. Recently played slot machines may have their chairs pulled out. It’s the only visible sign they have. As a reminder, the 5-pull method is to bet on an idle slot machine up to five times before switching to another machine. And, if any of those five bets is a winner, no matter how small, then stop playing that machine and move on. 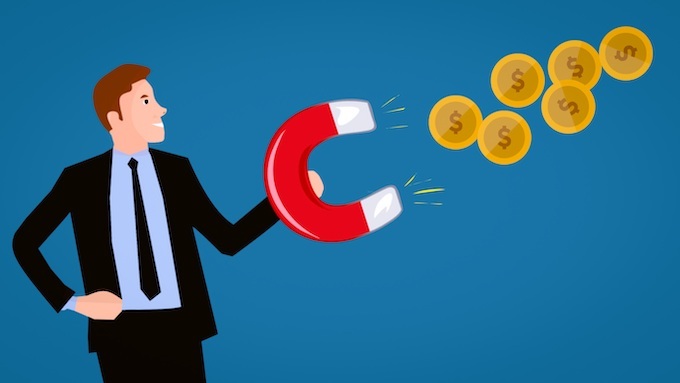 As I describe elsewhere, the underlying principle of the 5-pull method is that both new players at any machine as well as long-term idle slot machines are recognized and rewarded. Meaning, the 5-pull method is two slots strategies rolled into one approach. Either slots strategy might be in place at a particular casino, but both might also be in place. By playing only idle machines, I was trying to use both strategies at once. After spending the original $100 bankroll, I had $91.60 in total winnings. That’s a personal payout return percentage of 91.60%, excluding bets made earlier in the high limit slots room. At this point, having won back almost all my allotted bankroll, now I’m willing to admit that I didn’t try enough in the high limit slots area. We’ve found that one of my winning slots strategies is set up by Rivers Casino to work here. That’s great, but what other winning slots strategies might also work. While I’ve yet to find a single casino where all 7 of my winning strategies work at the same time, that doesn’t mean we’re done learning. Let’s see what else appears to work here. I’ve been to the players counter, the high limit slots room, and played a bunch of idle slot machines. What else was there to try? Well, one of the types of reviews I want to start offering is of specific slot machine game themes. That seems to be of interest to you. I certainly have my favorites, so I appreciate if you do as well. There is very little connection, if any, between new game themes and winning slots strategies. Whether or not a slot machine is a winner depends upon how the casino has set it up. Other than laziness on the part of the casino, there’s no reason a casino would ever set the odds of winning to be identical on side-by-side slot machines possibly excepting traditionally networked progressive slot machines. But, maybe not even then. So, I don’t have a lot of interest in different games themes because I don’t think they matter when it comes to winning. But, what is important to me is meeting your needs and interests. So, therefore, I’ll review a new video slot machine at Rivers Casino Pittsburgh. With my $91.60 voucher in hand, I went for a walk in the casino to figure out what else I could learn for you with my remaining bankroll. That’s when I spotted a pair of Dragon Emblem Jackpots by Konami penny slot machines. What I noticed was the admittedly attractive woman winning at one of those slot machines. When I was walking by, all the roll-up noises caused by her winning was very distracting. So, being single as well as liking winning slot machines, I sat down next to her, said hello, and started playing the machine next to her. It sucked. Seriously. It was such a loser. I could tell right away. No action. No winnings more than the occasional 20-cents or 40-cents. I quickly lowered the number of credits I was betting so I didn’t lose my bankroll completely. I started around 600-credit bets and reduced it until it was around 120-credit bets. But the woman on the nominally identical machine next to me was doing great. She was winning free games after free games. She even got free games during her free games. Sure, the difference between the results of our play could have just been luck. Certainly, luck plays a role in every bet on a slot machine. But, I can’t help you be lucky. I can’t even help myself be lucky. But, what I can do is look for patterns that tell me something about how the odds of winning are set on particular slot machines. It seemed like her machine had better odds. In fact, it seemed like it had much better odds. Then, like some crazy person, she left. She just walked away from a winning slot machine. Who does that? Maybe she thought her winning was just luck. I guess. Perhaps she needed to be someplace else. Anyways, I slide right on over and put my players’ card into the machine as quickly as possible. Why? Well, one of my theories mentioned in a recent podcast episode has to do with how casinos can remotely change the odds of winning on idle slot machines. And, no players card in the slot machine and no bets made either is an idle slot machine. So, I made it not be idle as quickly as I possibly could. Can you guess what happened? I won. I won, and I won, and I won. It was great. Now, by the time I started playing this second Dragon Emblem Jackpots by Konami penny slot machine I was down to around $50 of bankroll. So, I kept my bets small. That means I didn’t win a lot in terms of dollars. I won often, but each win was small. I won a lot more than I spent with my bets of $1.20 each, though. Below is a picture of a $15.50 win. There was another bonus game win of $35.10 and another of $44.20. My bankroll increased back up to around $100. Then I went to dinner. Like a crazy person, I got up and left the slot machine. Why? Well, I was pretty hungry, and the buffet would soon close. But, again, I wasn’t there to make money. I was there to help you make money if you visit Rivers Casino. I’ll mention now that I came back to this same slot machine about an hour later after I had my buffet dinner. Guess what? The odds on that former winning slot machine were now terrible. Isn’t that interesting? While again it is always possible to have a winning streak based on luck, which for many table games players is a fact of their gambling life, we know better. When playing slot machines, sometimes it’s entirely luck, and sometimes it’s not entirely luck. For this slot machine, assuming it wasn’t entirely just old-fashioned luck the first time around, it felt like someone lowered the odds while the machine was idle. I cannot prove my point to you about this being the case for this slot machine. Why? Because I don’t work at this casino or any other casino. Nor do I have the specific job of the person there that has access to the changing odds of winning for this slot machine. But, as you perhaps already know from your own experiences, it happens so often on one slot machine after another that it’s obvious something is going on. And, technically, it’s entirely possible. And, being possible, why wouldn’t casinos do it to help guide their financial performance metrics wherever state regulations don’t legally require a maximum payout return limit on a per bet and per slot machine basis. After all, few states have such a specific gaming regulation. Do you like buffets? I love them, including all the variety while building my plate of food. I’m only slightly kidding when I say I love reviewing casinos for my Professor Slots business mostly so I can sample so many beautiful buffets. Again, I’m only slightly joking. 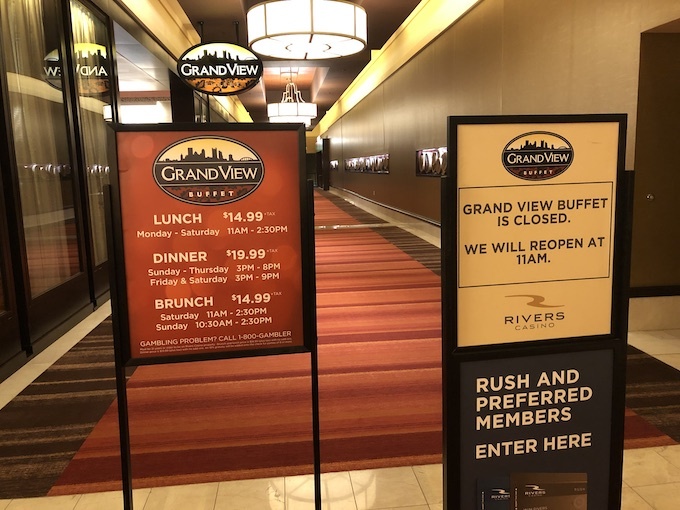 The Grand View Buffet at Rivers Casino Pittsburgh was both excellent and inexpensive. Using my Rush Rewards Players Club card at the base Gold tier level got me a 5% discount on the costs shown below. That was nice. I’ll note that there are more significant discounts for the higher tiers. This buffet is upstairs at Rivers Casino. Just go up the escalators at the back of the casino. It’s basically on the second floor along with a hallway to several large conference rooms. The buffet itself is a surprisingly large area with about seven different cuisines. I sampled everything. It was all good. If Pittsburgh isn’t your hometown, then you may not be interested in what’s happening in the greater Pittsburgh area. I’ve been to casinos build out on a vast cornfield in the Midwest, where there frankly isn’t much to do except whatever the casino itself offers. 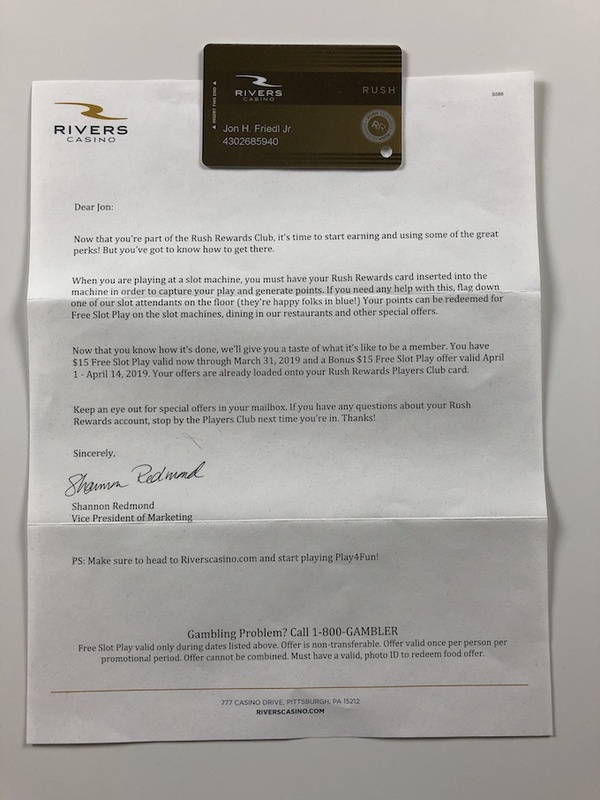 If Pittsburgh is your hometown, or if you frequently visit Rivers Casinos in other states with the same Rush Rewards Players Club, then we need to talk about complimentary gifts. If you’ve identified your slots gambling goals as including earning complimentary gifts, then you’ll want to know what the Pittsburgh area has to offer. Why? Because I assume you will succeed at earning complimentary gifts. Whether this is at Rivers in Pittsburgh or Chicago or Sugarhouse in Philadelphia doesn’t matter. Once you start winning comps at any of them, it won’t be long before you start getting offers to visit the other two properties. As in, free offers to travel on the casino’s dime. It wouldn’t surprise me if Sugarhouse and Rivers Casino Pittsburgh had a bus which regularly transported their slots players in their upper tiers back and forth between the two properties. Further, Rivers Casino Des Plaines-Chicago probably flies them into both Pittsburgh and Philadelphia. With all that in mind, what does Pittsburgh have to offer? If you happen to have a personal host due to being in the Signature tier, have you told them what do you want? As it happens, I’ve written up many of the comp possibilities in Winning Strategy 3: Earning Complimentary Gifts. Yes, earning complimentary gifts or “comps” is a winning strategy. For many slots players, they spend everything they win. So, where’s their profit, if any? It’s in the variety of free stuff they get. If it’s not a trip, then you’ll want to set aside a spare bedroom for them. As I’ve mentioned elsewhere, re-gifting to family and friends is well worth considering. 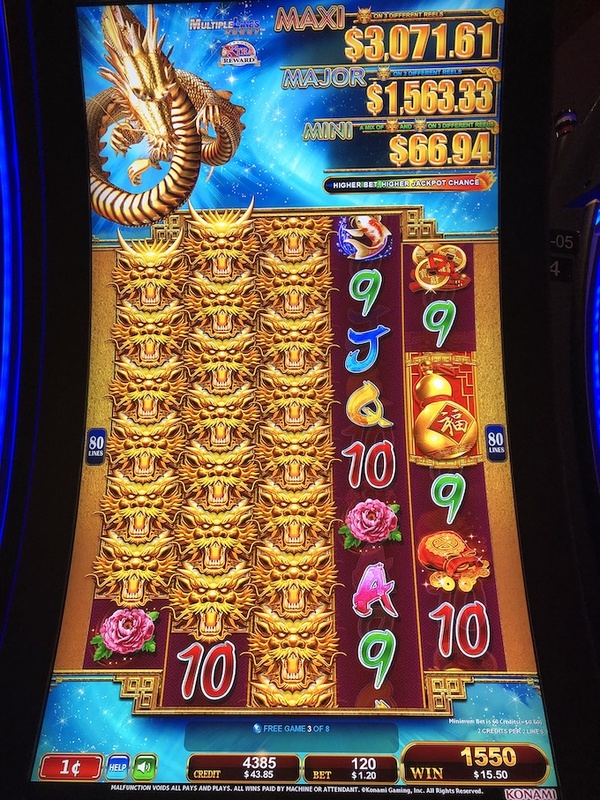 In this review, I covered its rewards club, high limit slots room, idle slot machines, a penny slot machine called Dragon Emblem Jackpots by Konami, its buffet, and the local area to help provide insights into possible reward comps in the downtown Pittsburgh area. Pennsylvania Slot Machine Casino Gambling – Until recently, Pennsylvania slot machine casino gambling consisted of 14 possible casinos: 7 racinos, 5 standalone casinos, and 2 casino resorts. One of them opens in South Philadelphia in late 2018. But, as of October 2017, casino gambling was legalized at truck stops, airports, 10 new satellite casinos, and online. Previous: Top 9 Slot Tips by RunHorse (YouTube Video Review) – With top 9 slot tips by RunHorse, I review a 13-minute YouTube video from mid-November 2018 purported to offer a collection of slots tips. Of the 10 tips provided, some are duplicates while others are simply small variations of others. Several are useful. Other tips I’ve already provided as full blog articles months or years ago. Next: To Be Determined – TBD.